Oh my goodness! I made it with most of my sanity in tact (though I guess that could be up for debate…) It’s been a long 6 weeks full of illness and set backs, but my kitchen is done! And I’m so thrilled to share it today! 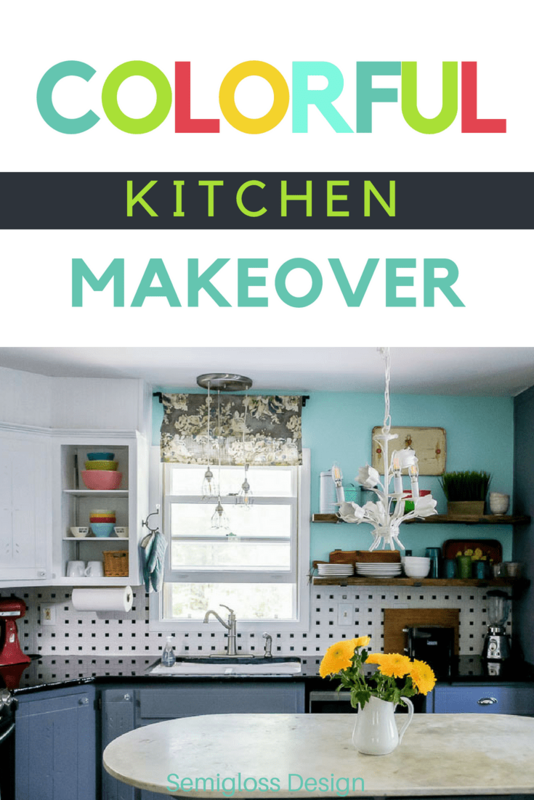 In just 6 weeks, I completed a mini kitchen makeover on a budget to make my kitchen look like it belongs in my home. 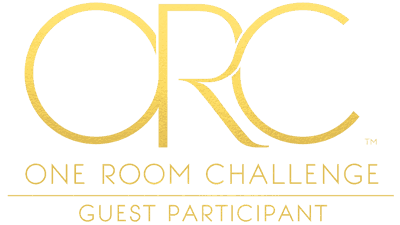 Huge thanks to Linda for hosting the One Room Challenge twice a year. In just 6 weeks, 20 designers and over 200 guest participants give a room in their home a makeover. I love the motivation from this challenge! This post contains affiliate links. 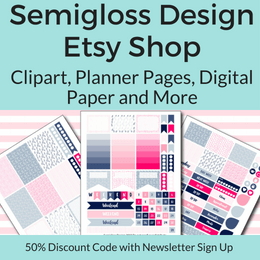 By purchasing an item through an affiliate link, I earn a small commission at no extra cost to you. 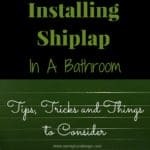 The cabinets had been repainted, but there was still work to do. 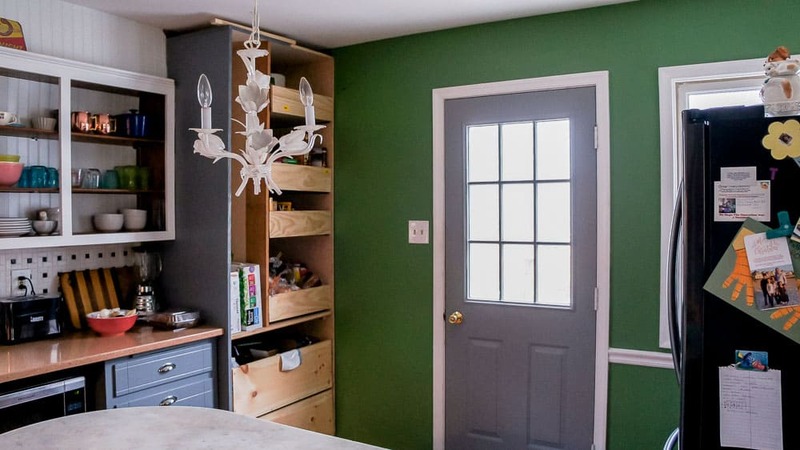 I wanted the soffit gone, some cabinets removed, doors for the pantry and an overall cuter look for my kitchen. We didn’t finish the pantry doors, so I hung a curtain there for now to hide the mess. But everything else makes me super happy. We also moved the island to a position that I didn’t think would fit. It feels much better now. I’m definitely an open shelf kind of girl. Even though we went from 3 shelves in the cabinet to 2, there’s more space for stuff. These brackets are fantastic and so sturdy. The toaster makes me feel really special because it has a gluten free button just for me. It’s the little things in life. Thanks for acknowledging my crappy bread, toaster!! The dated microwave cabinet was also removed and replace with open shelves. 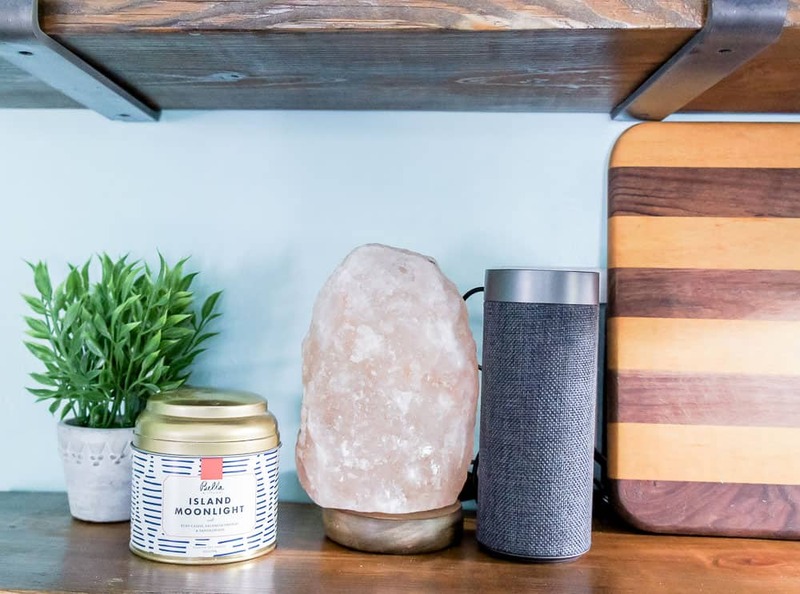 Now we can use the microwave outlet for important stuff like Alexa and a salt lamp. Gotta set the mood, ya know. The hood vent was covered and can be opened to access the knobs and cabinet inside. So much cuter now. Tutorial coming soon. The old fluorescent fixture was replaced with this one. 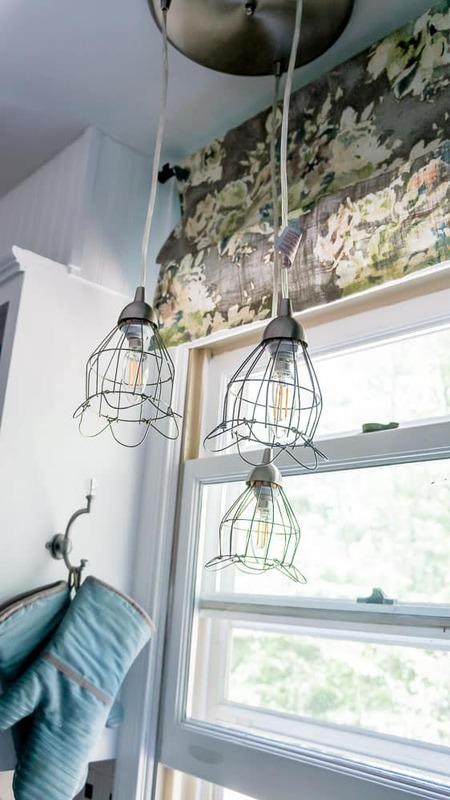 It’s made from wire cages that I bought a few years ago from Sweet Clover and a pendant light fixture. I like how they look like flowers. 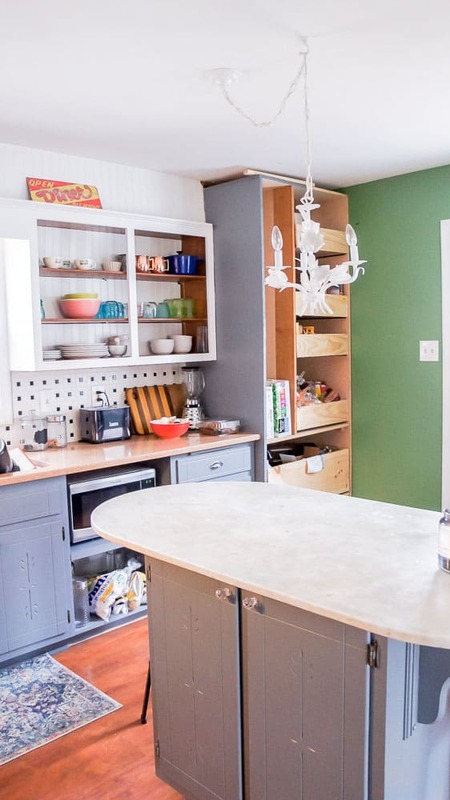 The biggest change was the countertops. I LOVE how shiny they are. Can you believe they’re concrete? 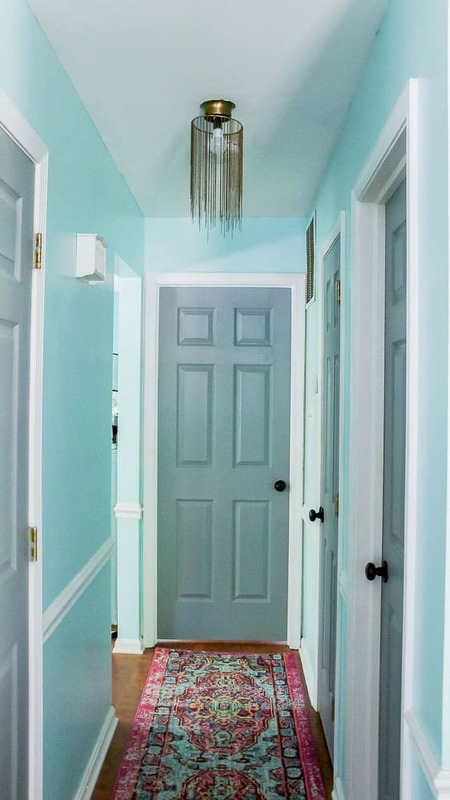 Even the hallway got repainted. It always bugged me how boring this hallway was. I love the color with the runner now! I removed all the baby photos of my kids because apparently they’re very embarrassing. A gallery wall will replace them. 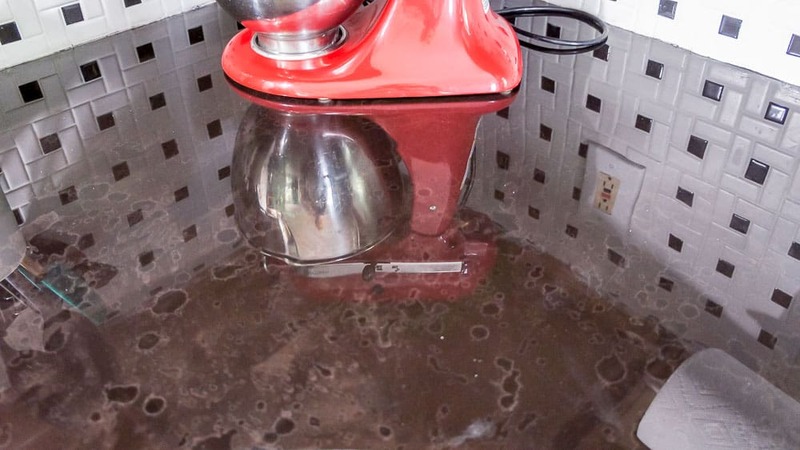 I sprinkled red around the kitchen to tie in the KitchenAid mixer. This vintage tray never sold, so I took it as a sign that it should be mine forever. 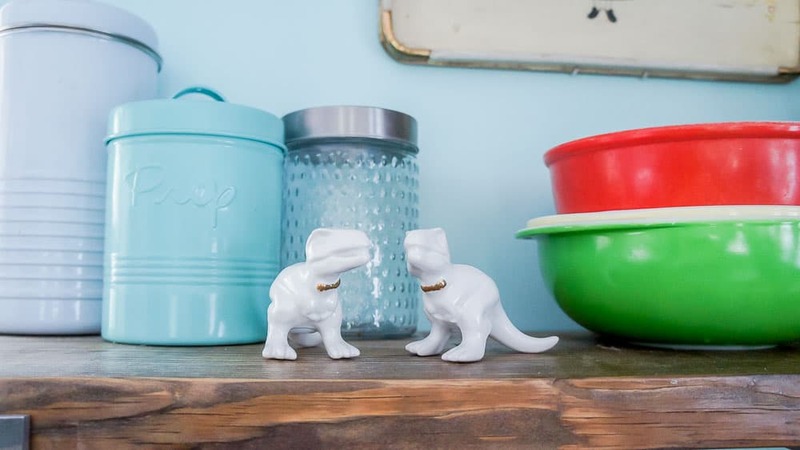 Every kitchen needs some dinosaurs. These salt and pepper shakers were a gift from my daughter. I like their bowties. 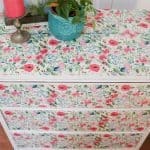 The inside of this cabinet got painted with eleventy billion coats of paint. The basket is so hide medicine. I kept my existing tulip chandelier. The scale is perfect for the kitchen and it looks nice with my vintage Italian chandelier in the adjacent dining room. Ironically, after working on my kitchen makeover for 6 weeks, we’re eaten frozen food tonight…. NICE WORK! I still can’t get over those countertops! Incredible! 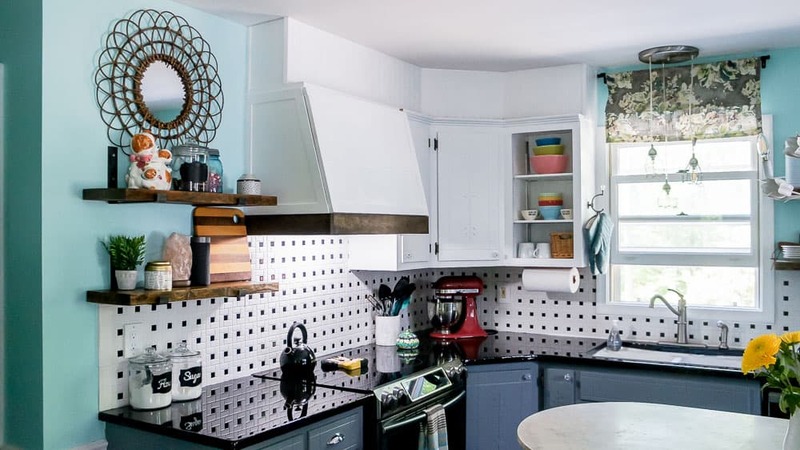 such a fun kitchen and so very you! 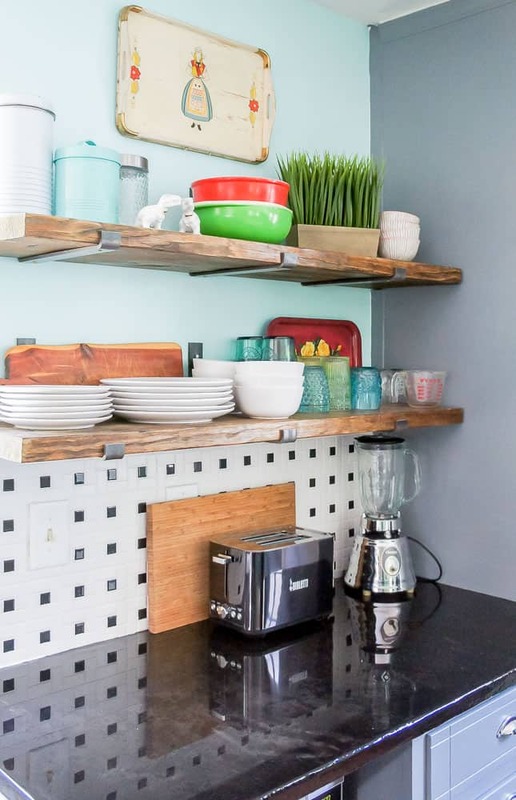 i love the shelving and the new countertop finish especially! Looks lovely! I absolutely love those salt and pepper shakers. I need to up my salt and pepper game…I think we have the disposable ones from the grocery store grilling aisle lol. Thanks Brittany. I have cow salt and pepper shakers too. But our main one is from Target to grind fancy pink salt and peppercorns. 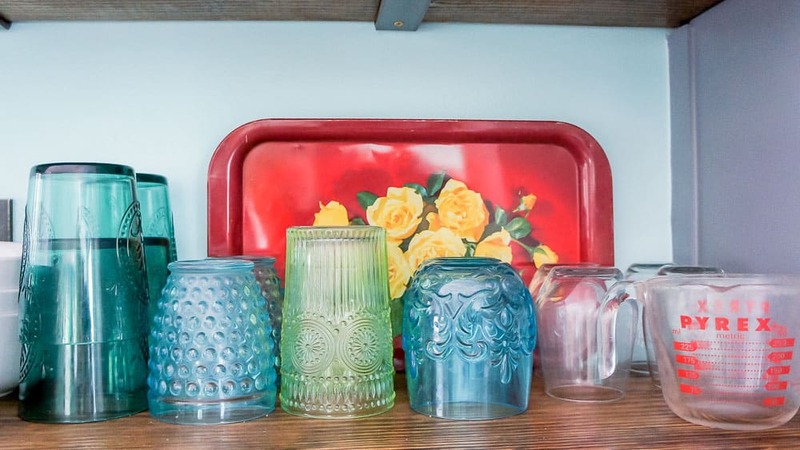 Vintage S & P shakers are fun to buy too. I went to a garage sale once with hundreds of them. 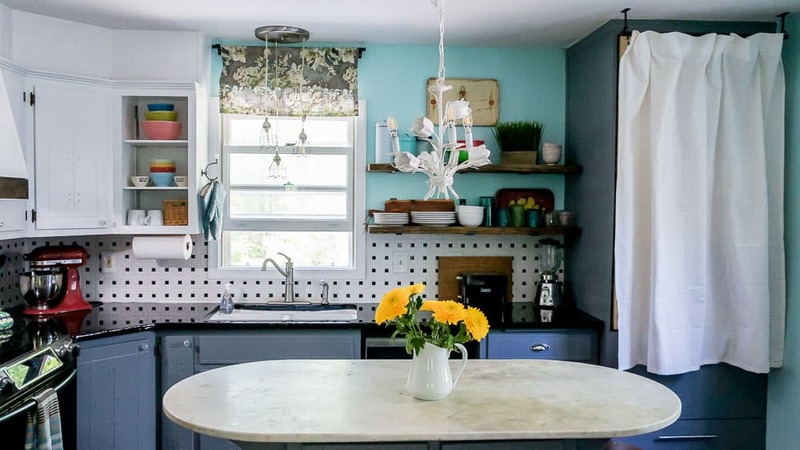 Emy I totally LOVE how personality infused this space is, so colorful, creative and happy! 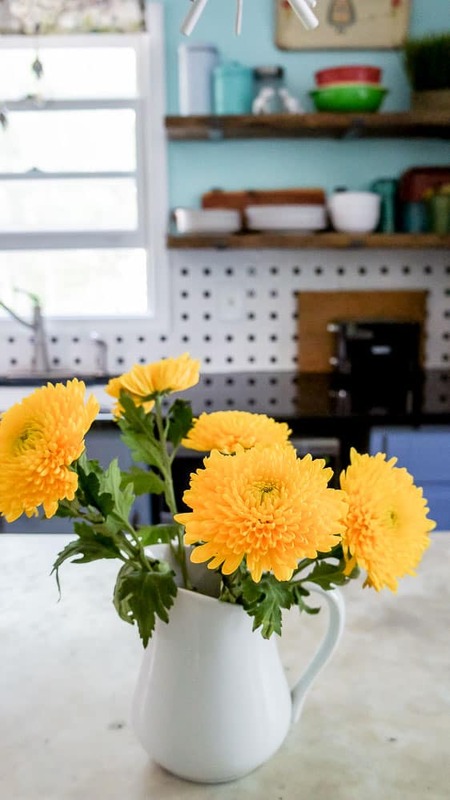 That color on the walls of the kitchen and into the hallway is so bright and cheerful. But seriously. Those countertops?? You know I have been dying to see how they came out and girl you did not disappoint!!! Now I am giving the major stink eye to mine that still remain that lovely vomit color! What a transformation!!!!! 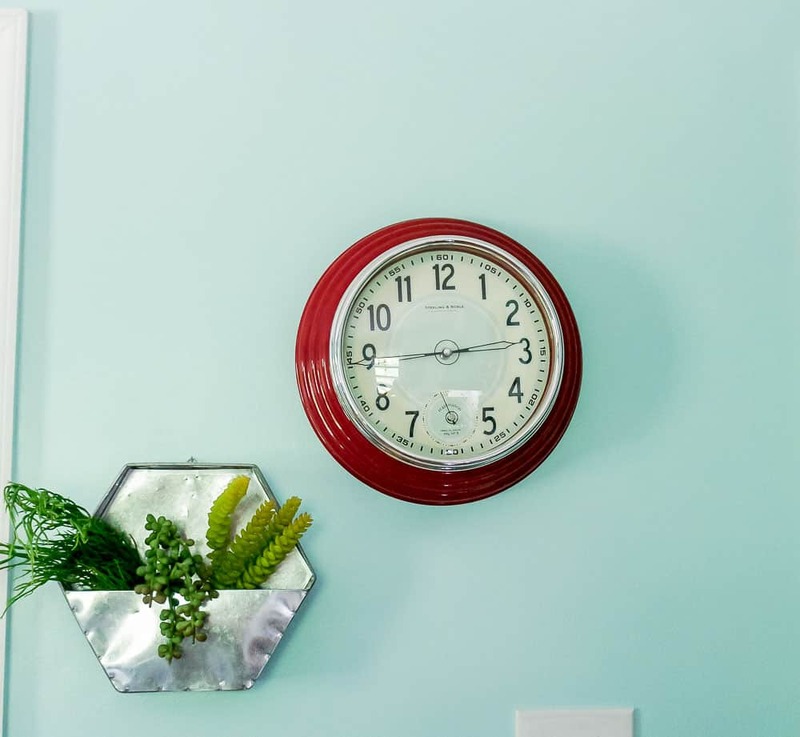 Everything looks fantastic and you did this all while recovering – you are a DIY and decorating superhero!!! Thanks Lisa! I’m so glad the baloney vomit countertops are gone. Totally worth it. Your kitchen turned out so well!! I think I said this last week, but I love your counters! Thanks Michelle. Sometimes Target stuff ends up on Amazon or ebay. The teal is so lovely here. 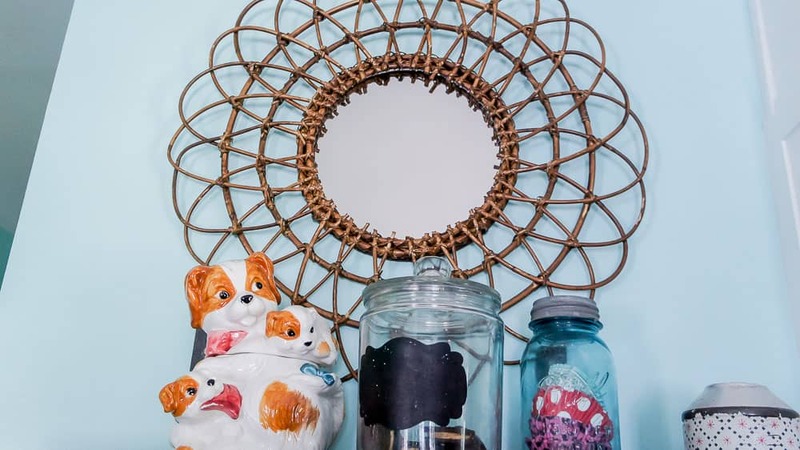 It makes this space so much more fun! Thanks Mila! It’s such a lovely room to hang out in now. 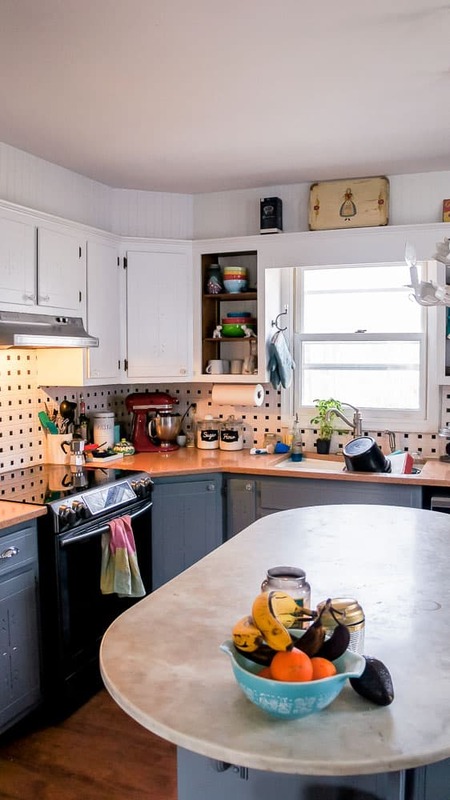 This kitchen is so you. Warm, cozy, and beautiful! I love that fabulous countertop. 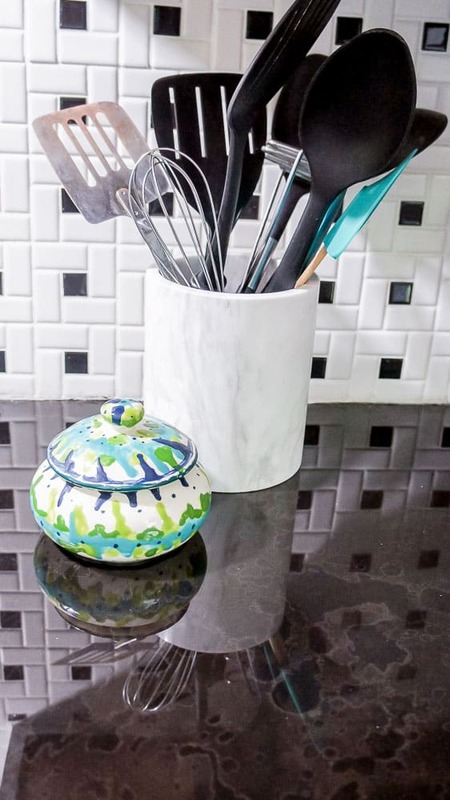 It looks like granite – and that cookie jar, so unique. Not to mention the tiles, they are lovely and make the room pop. By the way, I have that rug in my bedroom. Thanks Delia! The rug is one of my favorites. I love how fun and bright it is. What an amazing space and great colour choices. Ok I HATE cooking but I would WANT to cook in this space! Such a lovely job Emy!! I hate cooking too, but it makes it a little nicer to be in there now. This looks so cute Emmy! All of your vintage touches are so warm. 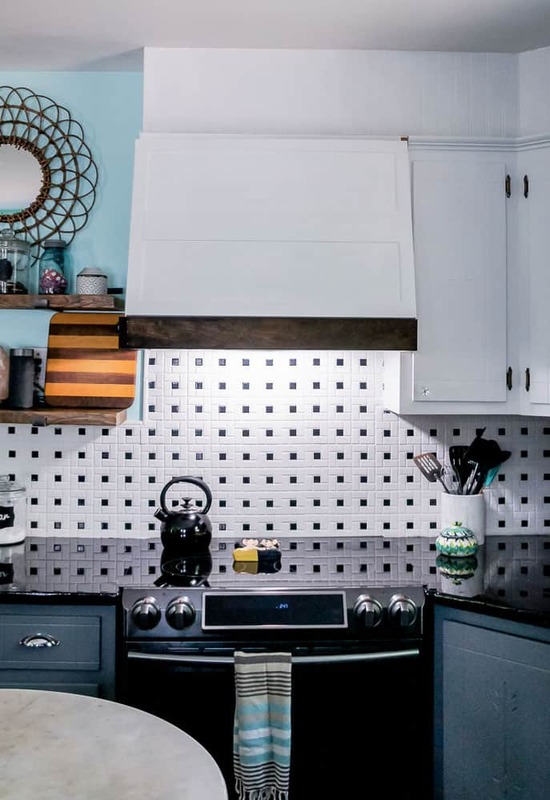 I love those shelf brackets, very cool. 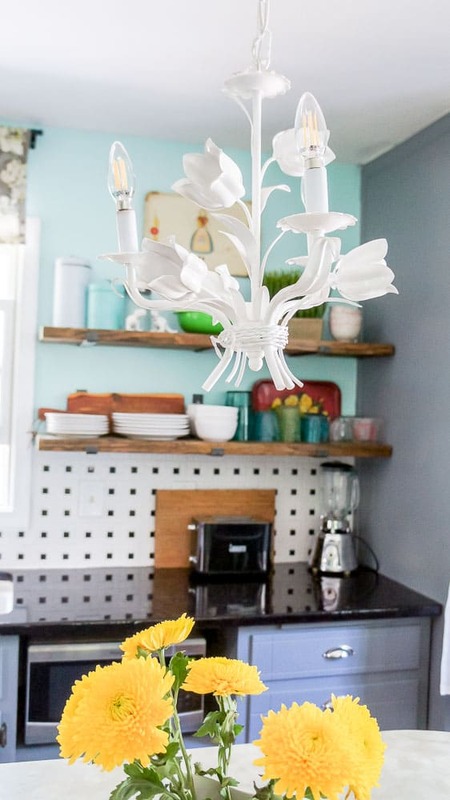 The light fixture over the sink is so cute! 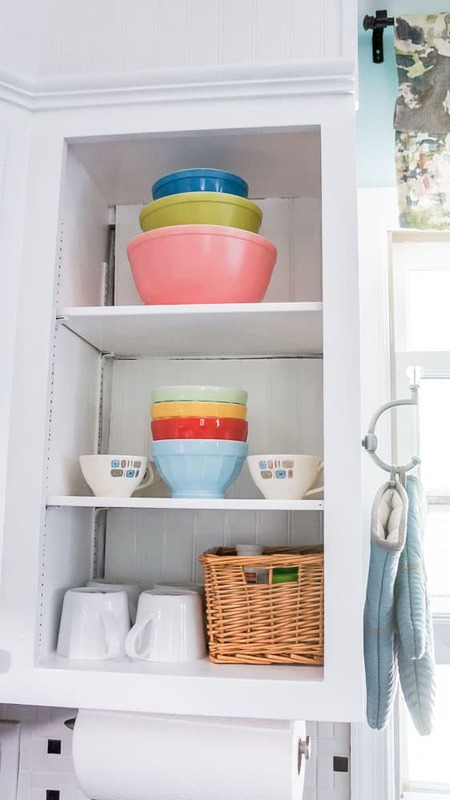 I am swooning over all the gorgeous color in your kitchen! I love how it brightens your space. And those countertops are amazing!! Congrats on a stunning reveal! It turned out awesome army! Such a fun space to cook in! I love all of the cheerful colors you used! Congrats on a fantastic project! Ugh auto correct got me. Emy!! Sorry about that! Your kitchen looks amazing, just as I knew it would! 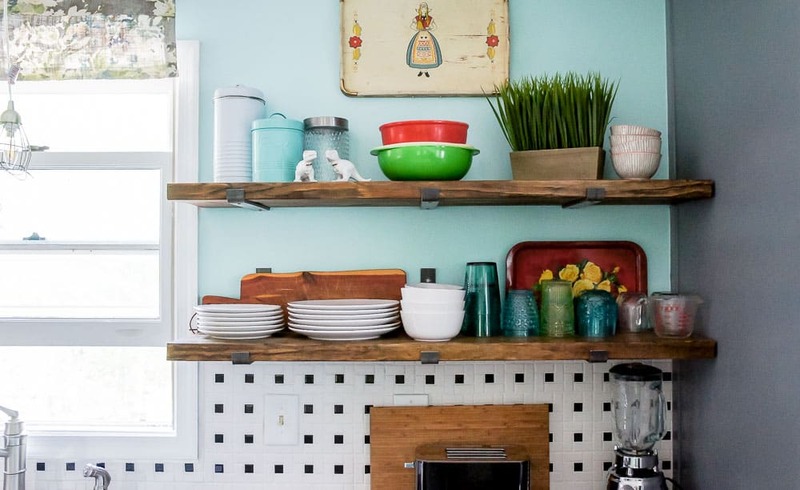 The open shelves look amazing, especially with all the vintage goodies you styled them with. 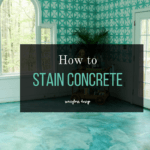 🙂 And those concrete countertops – definitely my favorite part of the whole room! It looks just terrific, Emy. It is such a happy, colorful room. I always enjoy your makeovers for the ORC. Oh Emy!!! 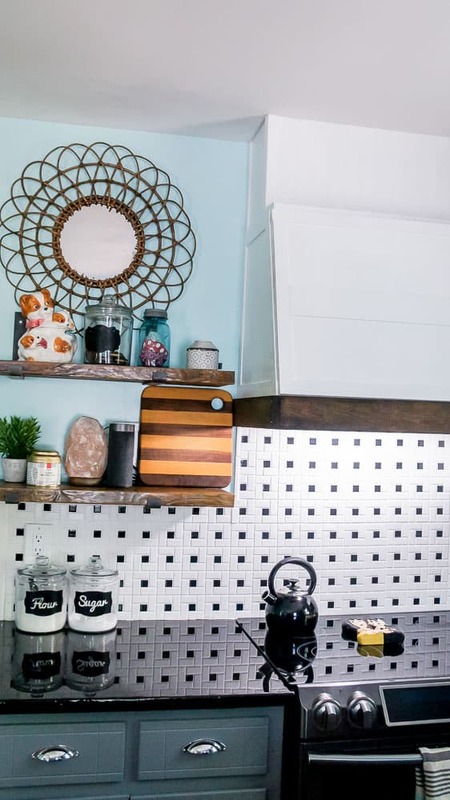 This kitchen is so YOU!! 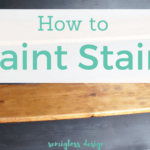 I love all the color and those countertops…Wowza!! Your island looks great turned that way, it looks you have more space now and you know how I feel about those open shelves….I am still working on the hubs to get some of my own! Congratulations on a beautiful makeover! !